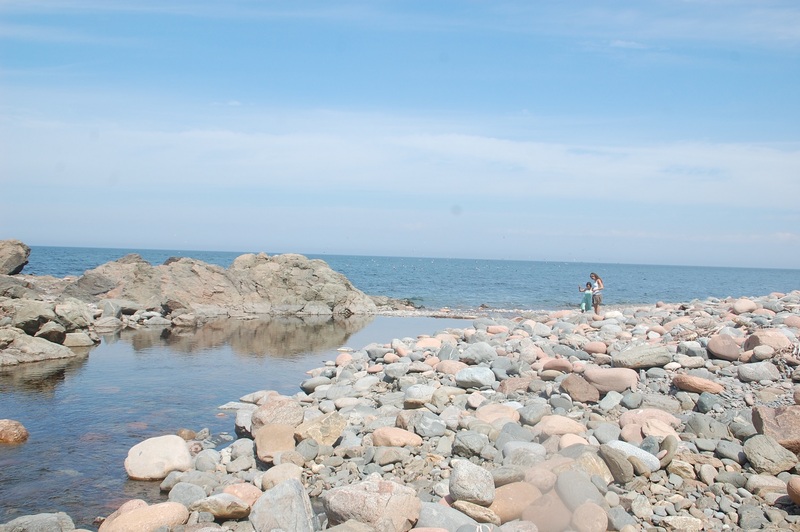 Chased away by the bugs at Seafoam Campground in Nova Scotia, we made our way north. Looking rough, we caffeinated at a Tim Hortons and then took an extended picnic at the town park in Antigonish. A short time afterwards we drove across a causeway onto Cape Breton Island and immediately missed a turn which brought us to The Curious Collector. Items purchased at The Curious Collector: One massed produced beer stein, a “wade” (collectables made for Red Rose Tea), a collection of Archie comic books, and one small metal seal. Most important acquisition, however, was the mass of local knowledge offered by the proprietor, Robert Olson, free of charge. From him, we learned that the sea food chowder (along with the “bucket of mud”) made down the road was good enough to be featured on the Food Network, that there was a nifty route that cut across a valley and would take us where we wanted to be, and the perfect beach to spend an hour or two. Well, the chowder was excellent, the drive wonderful, and the beach amazing. Later we stumbled upon another beach side campground but this one was mostly bug free. The wind did howl, but all in all it was an excellent night. This then positive momentum rolled into what I call “Nature’s Infinity Pool.” Back at Bay of Fundy Corey noticed a woman with eccentric hair. She then spied the same person (and said hello) at the bug infested campground from hell. When we pulled off the road to check out the first campground at Breton Highland National Park, there she and her husband were. It was like greeting old friends. They told us of the little pond stemming from the river that spills into the ocean. He was wearing swim trunks when he told us. So two hours later, wet and refreshed, we took a hike. And then after that hike we swam some more. Later on we noticed an Outback from Illinois. Driving this Outback was a family of three from Chicago. Weird. Two of the three (dad and daughter) were musicians and later they treated us to some fine fiddling and guitar strumming. They truly made our night and hope that we reconnect closer to home. So the next day we hung out some more at the beach, hiked a few trails, and then revisited Meat Cove. 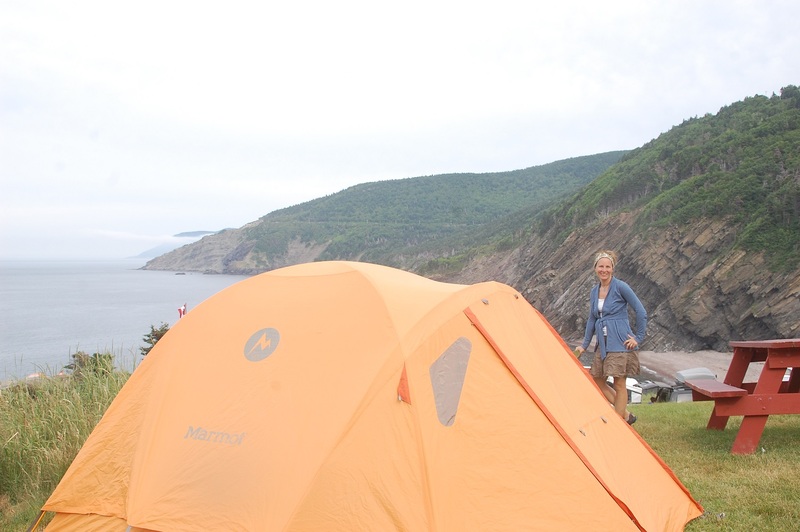 And here is the thing about camping, for $30 we get to pitch our tent at the northern most tip of Novia Scotia. There is a Chowder House too and even though we ate seafood for lunch, we paid the $12 for a bowl of that fine white stuff. Yum. The waitress, she was six the last time Corey and I came this way. I told her how I remembered some kids playing at the beach who said sharks infested the water (I suspect this was said to keep kids from the water). She said that her parents use to always tell her that but she kind of knew they were wrong. 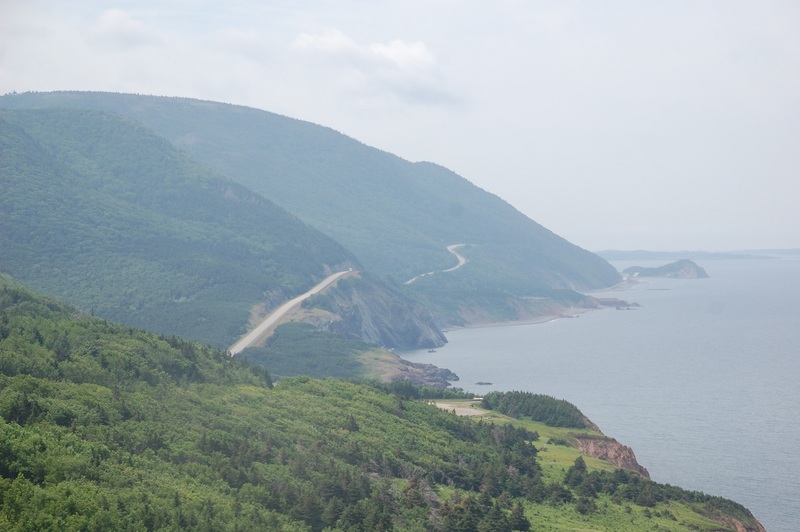 By her count only six families live in Meat Cove and her family has owned the campground for the last thirty years. In the winter a bus took her the six graveled miles up a winding cliff over a lot of snow and ice to school. Once a week the entire school day was devoted to learning how to ski. Sometimes they worked on ice fishing too. I am not making this up. So all good things come when one goes home again. Next time I write will hopefully be from Newfoundland. This entry was posted in 2014 Summer Trip: The Viking Within and tagged Breton Highlands National Park, Meat Cove, Nova Scotia by hennacornoelidays. Bookmark the permalink.